Mohan Chandra Rajneesh angered and embarrassed Hindus, and Jim Jones created an embarrassment for Christians. Some old-fashioned Christians would see him as influenced by Satan, and Pentecostalists would have a special reason for being offended. 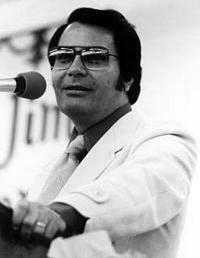 Jim Jones grew up in Indiana during the Great Depression with his parents struggling to find work and to make a living. Jones was a boy with curiosity. On his own he wandered into a Pentecostalist congregation, the Gospel Tabernacle, on the edge of the town of Lynn, in Indiana. The congregation was largely of people from Kentucky and Tennessee who had come to work in Indiana during World War II. Better established residents called them hillbillies, "holly rollers" or "tongues people.". In early adolescence Jones was not interested in sports or play with other boys. He was interested in the religious ecstasies that he found at the Gospel Tabernacle. There Jones was introduced to spiritual healing, and there he learned to preach and win praise. At the age of sixteen, in 1947, Jim was preaching on street corners, believing that he had wisdom and knowledge that others needed, and a few people would stop to listen and reward him with coins tossed onto a blanket next to him. Jones believed in brotherhood. Jones dressed as neatly as he could for his preaching, but he sympathized with the poor, and he preached also in black neighborhoods. What he did look down upon was the frivolity and sinfulness of other boys his age. Jones fancied that he was a leader among boys, and he feared rejection. At his home, his closest friend started to walk away in defiance of his orders. Jim grabbed his father's pistol and shot at his friend, missing him as he ran down the street. In high school, Jones was a diligent student, and in his assigned readings he took special interest in two men who had experienced great power: Adolf Hitler and Josef Stalin. In his later high school years, Jones worked part-time in a hospital, and there he met a student nurse, Marceline, who was impressed by the way he got along with patients, and she was impressed by his helpfulness and his concern over social issues and world events. Jones described himself to Marceline as a person of principle, but he stretched the truth and told her that he had been the star of the high school basketball team but had quit because his coach had slurred black opponents. After Jim Jones graduated from high school – with honors – he started college, and he and Marceline married. In college he continued his bible reading, and he was inclined to quote the Bible in discussions. These were stormy times for Jones. His marriage was not going as well as he wished. Marceline had hoped for partnership but Jones was insecure, domineering and jealous of any attention she gave to others. She found his emotional explosions unendurable and his tirades difficult. But she had been taught that marriage was a lifetime proposition, and she feared the stigma of divorce. She decided to stay with her marriage. Jones tended to be intense about whatever he chose to become involved with. He entered a period of doubt with intensity, and he threatened to kill himself. He claimed that his experiences working in the hospital and his seeing the poor on city streets had led him to conclude that a merciful God would not allow such suffering. There was no God, he proclaimed. And he denounced churches as hypocritical for screening people according to the color of their skin. Then Jones became intensely impressed by the stands taken by his wife's church – the Methodists. This was 1952, and the Methodists were espousing rights for minorities and putting an end to poverty. Jones was impressed too by their opposition to unemployment, their espousal of collective bargaining for working people and security for the aged. In 1952, while still pursuing his undergraduate studies, Jones accepted a position as a student pastor at the Somerset Methodist Church, a church in a less than affluent, predominately white neighborhood in southern Indianapolis. During his days as a student pastor, Jones secretly visited various African -American churches around Indianapolis. He made friends with some of the people he found there, inviting them to his services and into his home. He took with him on his outings to African-American churches Marceline's twelve year-old cousin, a boy who had been living with Jim and Marceline since they had rescued him from a foster home. Jones tried to adopt the boy. The boy was not comfortable with Jones and resisted. Jones lied to the boy, telling him that returning to his real mother was hopeless, that she did not love him and was not a person who was worthy. The boy visited his mother and concluded otherwise. Combating abandonment by the boy, Jones went into one of his emotional fits of authoritarianism. The boy abandoned Jones' and returned to his mother and disliking Jones he would run whenever Jones came to visit.